On Wednesday 3rd April, UKFast is hosting a live webinar on containers in the public sector. But why is this such a hot topic? Public sector organisations are facing huge pressure to modernise legacy systems and embrace cloud technology. Luckily, containers provide an effective method to aid this mission and the overall digital transformation of the public sector. Two isolated containers sharing the same host operating system and resources. Recently, our DevOps engineer Tim shared his expert knowledge on this subject. Essentially, a container is a standard unit of software which packages up code and all its dependencies. It contains everything you need to run an application code: runtime, system tools, system libraries and settings. Each container shares the underlying operating system of its host server with other containers. This allows the functionality of a single server to be split up and shared. In turn, resources can be shared and managed with higher efficiency. Why is the public sector using containers? During Wednesday’s webinar, the advantages and considerations for public sector organisations using containers will be discussed by a panel of experts. But, in short, there are a few main reasons why they’ve become so popular. Thanks to the introduction of a cloud-first strategy, the public sector is largely moving from legacy systems to more modern ones. Therefore, organisations need a manageable way of developing and deploying new applications, as well as keeping everything up to date and secure. 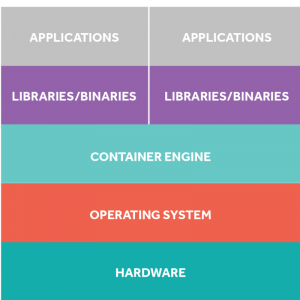 Containers make all of these processes a lot easier compared to the applications just sitting on a server or virtual machine. Different components can be updated at different times and applications can be delivered in increments. Developers can build without affecting the host. And operations decisions can be made without affecting applications. In other words, new systems can be developed and deployed as and when needed, without the worry of them affecting other parts of the system already in place. This speeds up the whole process by making the system more flexible and efficient. Time, resources and money are also used in the most effective way. For the public sector, which is continuously expected to deliver improved services while saving money, this is a huge advantage. But I have so many more questions! How can public sector organisations start making use of containers? What are the other advantages to operational efficiency and productivity? What are the security advantages of containerisation? What is the future of containerisation in the public sector? Then don’t miss the opportunity to tune in to our LIVE Containerisation in the Public Sector webinar on Wednesday 3rd April, at 11am. Hear from the experts, including public sector and container experts RedHat, and send in your questions to be answered live. Register for our LIVE webinar now to find out how the public sector is utilising containerisation in 2019.